TimberSeal provides full service cedar siding staining, painting and refinishing services to home owners in Northwest Indiana and the South Chicagoland region. Cedar provides a natural rustic feel to a home no matter how it’s finished. The finish itself however can dramatically change the overall appearance of your home. Some homeowners prefer the natural semi transparent stained appearance to retain the natural appearance of the cedar. Many homeowners however opt for a painted like appearance to cedar. Whichever look you desire TimberSeal can provide you and your home with the proper methods and procedures to insure you get the biggest bang for your buck. Below we’ll explain some of the options you have for finishing your cedar sided home. Successfully staining your cedar sided home (whether solid or transparent) is dependent on proper prep and finishing procedures. A home that is not prepared properly PRIOR to staining is destined for finish failure early on in it’s life. This then creates a substantial amount of work to remedy. The TimberSeal approach to staining and maintaining your cedar focuses heavily on the preparation procedures first and foremost. This includes a very thorough cleaning of the homes exterior to remove any and all dirt, debris and surface contamination. In addition we apply a treatment to kill off any mold and mildew spores and remove any growth that is on the home. If the mold and mildew is not removed odds are it will bleed back through and continue growing on your home in a matter of a few months to a year. Below is an example of mildew that has formed on cedar siding and the result after cleaning and treating the area. Our TimberSeal Pro-UV Oil finish is the choice product for the homeowners looking for the most natural finish on your cedar siding. It’s a penetrating oil finish that dives deep into the wood while protecting and accenting the wood grain, knots and texture. It’s retains 100% transparency and doesn’t act to conceal any of the wood… only accentuate it. TimberSeal Pro-UV is available in these fine colors. Sherwin Williams WoodScapes Solid Siding stain provides the painted type appearance often sought after by homeowners without a heavy film build that “paint” provides. The initial coat penetrates into the siding for tooth while providing a prime coat. The second coat builds on the protective qualities by creating a barrier between the wood siding and the elements. We offer WoodScapes for staining cedar siding in solid colors only and we can color match it to well over 600 colors or any sample you can provide. The average lifespan of WoodScapes Solid Siding Stain is around 7 years. Different variables and environmental conditions can shorten or extend this lifespan. 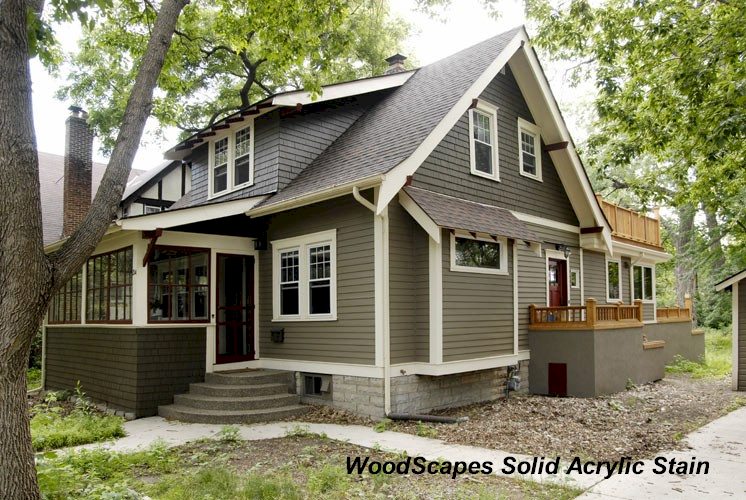 Click Here to view standard color selections in the WoodScapes Exterior Siding Stain. We can however match the product to any color sample provided. For further information or a quote on your refinishing or restaining project give us a call at 1-866-WOODCARE or locally at (219) 548-2670. For your convenience you’re also welcome to submit your request online at the link below and a representative will be in touch shortly. Click here to request an estimate for your project.